Molly, who has recently earned her teacher's certificate from Sogetsu school, celebrated by giving us all a small demonstration! Held in her lovely house, we all assembled after a gap of two months, and it was so nice to see all the smiling faces again! Crossing this sapota-laden tree, we entered, and of course, soon the house was filled with laughter, chatter and bonhomie. Molly looked nervous and tense, and had a strained smile on her face, but I think all our leg-pulling relaxed her. Or so, we thought! As we waited for everybody to assemble, I admired this lovely vine as it made its way up the side of her house. Demonstrating from the back, Molly was well prepared with her materials and containers organised in such a way that she could quickly move from one arrangement to the other, with a minimum of fuss. She interspersed her demonstration with a little explanation of the choice of her materials, and what she was aiming at. Her aesthetic garden provided a beautiful accent to the Ikebana, and also provided her with inspiration and material! The coconut fronds in the arrangement below were from her backyard. That was the question, and both options were tried. Palm, croton and two jerberas! The water lilies in her garden inspired her, as she did a floating arrangement, with a furled leaf adding a lovely touch, and rounding off her demonstration. Congratulations Molly, and looking forward to more demonstrations! I hope the summer heat is coming down atlast!!! Well, with Molly's demonstration coming up next week, its Ikebana time again !!!! Here is a post of the Headmaster's work for July! It is truly a very cooooool One !! Enjoy !! 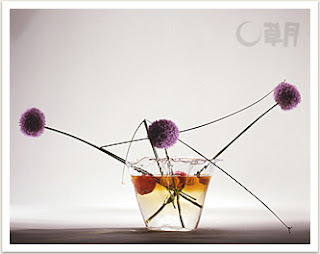 "Apples and Unshiu oranges decorate the surface of the water, colored by the stem-fluids of allium giganteum. The construction humorously contrasts the stalks in the water and those protruding out of it."